Can one reduce stress in 5 minutes? 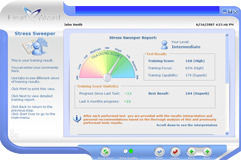 Stress Sweeper is a stress management training tool based on paced breathing. It’s a 5 to 15 minute session which can be repeated several times when necessary. Using milti-year research and working with collaboration with a group of international academicians, scientists have developed a simple-to-use tool that helps reduce your level of stress and builds strong resistance to the impact of stress in as little as 15 minutes a day. The tool provides a training mechanism with biofeedback that allows controlling the accuracy of person's paced breathing. With an increasing level of challenge, Stress Sweeper leads user to the enhancement of the overall immunity and body's increased resistance to stress. Normalize your blood pressure and improve the immune system. Stress Sweeper's on-screen pacer helps the user to breathe in the optimal way to get the natural healing rhythm in your body. At the same time it controls the accuracy of the breathing and its effectiveness by monitoring the heart rate during the session. The continuous usage of the service is not only a stress reliever, but also normalized blood pressure and improved immune system. Get your training score and reduce stress more effectively. After each training session you'll be assigned a score that reflects the effectiveness of the training session. Learn relaxation breathing step-by-step being controlled by Stress Sweeper. It has 3 levels of difficulty which are changed automatically. The start level is a beginner (1st level). It’s quite easy to achieve the maximum score of 100 on the 1st level. When you're consistently getting the highest score, your level is automatically increased as well as the analysis of his breathing accuracy. Now it’s harder to get the highest score, and so on. With practice, your breathing skills improve, and so does your ability to cope with stress, which leads to a healthier life and improves your immunity to stress. Competitive? Get your breathing score and compare it with your friend's scores. Everyone would benefit from such a healthy competition! Stress Sweeper session takes 5-15 minutes. During the assessment you'll be asked to breathe following on-screen pacer while being monitored by a special sensor. To perform the training, follow step-by-step on-screen instructions. You'll be asked to sit down comfortably near your computer, attach the ear-clip on your ear lobe (or finger-tip device can be used instead) and plug-in monitoring device into USB port of your computer. Start the session and continue breathing following on-screen instructions. Make sure you breathe normally without strain. After you're done Stress Sweeper analyses your session data and generates a report. Training Score. This parameter shows the actual score you got for the training session. It's being calculated based on your accuracy and performance during the test. If user's Training Level is "Beginner", he can get up to 100 points, "Intermediate" can get maximum 200 points, "Advanced" can get absolute maximum of 300 points. The level is being assigned automatically depending on the performance in several sessions. It can be increased as well as lowered when the performance is poor. The bigger score you get, the more trained you are, the better you can withstand to stress pressure and the faster you'll get stress relief. Your goal is to get 300 points. Training Focus. This parameter shows how focused the user was during the session in percent of the session time. Focusing means following the breathing pacer precisely. To get higher score user must breathe as accurate as he can. Training Capability. At some moments of the session user performed better than at the average of the session. These moments data is being analyzed to calculate this parameter. It shows what score user could have got if his performance was that well during the all session time. This parameter is user's potential Stress Sweeper score. Progress Since Last session. This parameter show the progress has been made by user since the last session. It is a difference in training score with the last session. Do your best to keep this parameter positive at all times. You now have the knowledge and the power to change this situation for the better. From this point on, use this tool wisely for your own health. You'll be able to manage your stress and your blood pressure in the natural way of breathing. We recommend to use Stress Sweeper every day for at least 15 minutes. The best time is probably right before going to bed and at any time you feel stressed or the Stress Monitor recommends you. Stress Sweeper implements scientifically validated relaxation mechanism used to re-train the body to build immunity to stress. Children and well-trained athletes have the naturally occurring healing rhythm called the RSA pattern or Respiratory Sinus Arrhythmia pattern. This is parasympathetic (relaxation) rhythm that helps one maintain a healthy life and healthy immune system. Due to our stressful lifes and the environment our bodies lost the balanced healing rhythm in favor of spontaneous unbalanced breathing rhythm. Why's that? Dynamically changing thoughts and imaginations cause heart and autonomic nervous system to mobilize organism resources in order to fight virtual fears coming from our brain. For thousand of years human beings suffered mainly from physical danger and not the mental. Therefore the amount of adrenaline produced in the body body's reaction on stress) biologically meant to help physically escape from the danger. When the "danger" is virtual and no physical activity followed the stress reaction, the organism gets heavily impacted by the consequences of that stress. Stressed person will get a physical workout with heavy breathing and hammering heart beats. But how to avoid the negative impact of stress? One of the ways is to physically run away from virtual danger. However, in lots of cases it is not always applicable in our modern world. Another way to avoid the negative impact of the stress is to have another sort of workout combined with relaxation. Stress Sweeper implemented that technique. As some of you probably know, most of the body's functions are controlled by the autonomic nervous system through its two branches providing stimulating or calming effects respectively. Stress Sweeper's paced breathing acts as an “exercise workout” to physiological mechanisms involved in the body self-regulation. Deep slow breathing causes significant synchronous changes in blood pressure inside of your chest due to respective changes in chest volume. This process stimulates autonomic nervous system to compensate changes in blood pressure and causes rhythmic reflexive changes in heart rate. It took me 3 weeks to learn the way of breathing that Stress Sweeper is showing. Now I'm on the second level with much better night sleep and steady normal blood pressure.